The Hal Rogers Fellow is the highest award given by the Kin Canada Foundation. This award was established to recognize Canadians who have demonstrated the high ideals to which Kin Canada founder Hal Rogers, was committed. Harold A. Rogers was born in London, Ontario on January 3rd, 1899. Harold (Hal) moved to Hamilton, Ontario to work for his father when he was appointed Manager of the Standard Sanitary Co. Ltd. Soon after the move, on May 1st, 1916, Hal, at the age of 17, enlisted with the 173rd Argyle and Sutherland Battalion. After further training in England, and anxious to get to the front lines, he transferred to the 54th Kootenay Battalion CEF, 4th Canadian Division, 11th Infantry Brigade. He fought at Vimy Ridge, Lens, Hill 70 and Ypres, where his leadership skills in the field led to his promotion to the rank of Corporal and a recommendation for a commission. Before it could be acted upon, he was gassed at the Passchendaele front (Ypres) and wounded at the Amiens front. After hospitalization in England, he returned home to Hamilton in January 1919. Missing the camaraderie of army life, Hal decided to join the local Rotary Club where his father was a member. Because a once fundamental rule of the Rotarians was to only have one member from each employment classification and as he worked as a salesman in the plumbing industry for his father, Hal's application was rejected. (It was a humorous recollection of Hal's for many years). Not a person to be outdone, Hal, then 21 years old, decided to create a new club. As a result of his initiative, a small group of like-minded men gathered for a dinner meeting on Feb. 20, 1920 and formed what became known as the Kinsmen Club of Hamilton – Canada's first Kinsmen Club. Throughout his life, Hal Rogers believed in the value of education. In his own words, "providing and promoting the finest and most effective education possible for our young people" was a noble endeavour. In 1946, Hal received the Order of the British Empire and was made an Officer of the Order of Canada in 1978. He was dedicated to the concept of education throughout his life. His commitment is evidenced in his many years as a Trustee on the Forest Hill Board of Education. 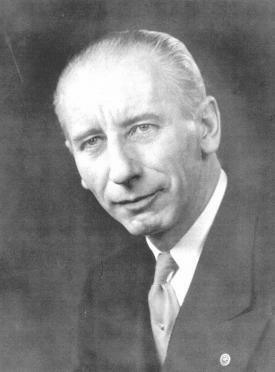 His devotion to the concept of education for young people was recognized by the Ontario Secondary School Teachers' Federation, which named him the first recipient of the coveted Lamp of Learning Award in 1950. The Lamp of Learning is awarded annually to a non-teacher who has contributed to the furtherance of education in the Province of Ontario. The concept of developing an endowment fund for the purpose of promoting and encouraging the pursuit of education was approved enthusiastically by Founder Hal. Consequently, after he died in September 1994, the Kinsmen & Kinette Clubs of Canada established the Kin Canada Bursaries, a program of the Hal Rogers Endowment Fund in his memory.